You did it again! You’ve helped push German pharma corporation IDT Biologika to change its ways. The company just announced it’s cut ties with horse blood farms in South America. This is a huge success -- it means IDT will no longer work with the most cruel blood farms we know about. Ever since our friends at the Animal Welfare Foundation told us that pharma giants were profiting off the cruel mistreatment of horses on “blood farms” in South America, SumOfUs members like you have been putting nonstop pressure on companies to cut ties. And it’s working. Over 300,000 of you helped draw international attention to the horses’ plight. 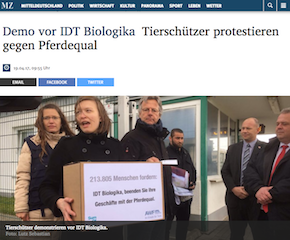 Together with the Animal Welfare Foundation, we delivered your signatures straight to the door of IDT’s Headquarters in Germany last spring, and we made German headlines. IDT isn’t the first corporation we’ve convinced to stop supporting these farms’ endless cycle of blood extraction, forced abortion and slaughter. 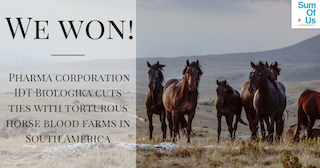 Another Big Pharma player, Merck, Sharp and Dohme (MSD), cut its ties last year after SumOfUs members like you demanded it stop profiting off of the torture of horses. And IDT won’t be the last, either. Three more European corporations are still buying horse blood from Uruguay and Argentina, and you can bet we’re setting them in our sights next. But this latest major win has already let them know that the tide is turning. The public will no longer stand by while horses are hurt and killed to put money in pharmaceutical execs’ wallets. Our mission to save the horses has gone from a trot to a full gallop -- and we’re so happy to have you along for the ride. PS: It’s only thanks to donations from SumOfUs members like you that we were able to win against another big pharma corporation. We don’t take any money from governments and corporations -- without support from people like you, we literally couldn’t exist. Please can you set up a small monthly donation today so that we can keep holding corporations to account?